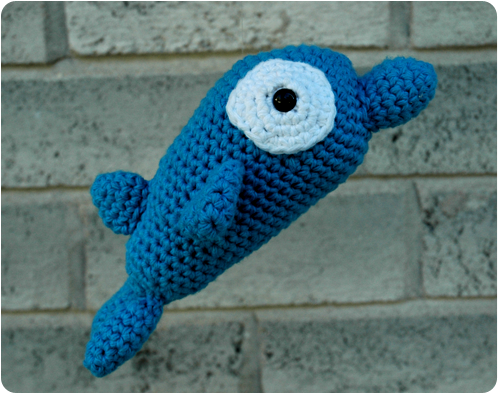 After making my crochet jellyfish, I decided to crochet a little dolphin. 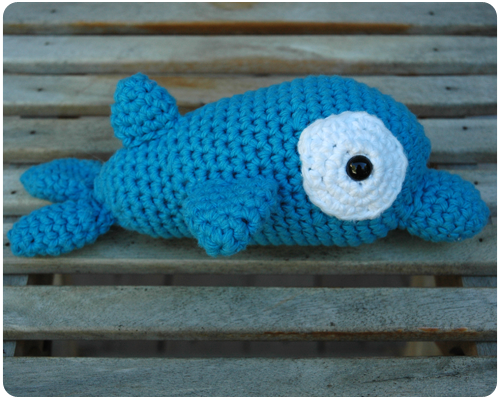 What inspired me to crochet sea animals? Why our trip to the ocean, of course. And what was even better was that we saw the real things when we were there - jellyfish laying on the beach that did not look at all like the one I made, and dolphins jumping over the waves. The pattern for this guy came from my trusty source for cute crochet animal patterns - this book. And of course I used Bernat Handicrafter Cotton (in Hot Blue), busting my stash even more. I have been loving your crochet creations. I need to pick up my crochet hooks again. Your critters look so good! Thank you Karen. I am having so much fun crocheting these toys. I hope you can get back to crocheting soon.